This frosting is so fluffy, creamy and delicious. It tastes a lot like whipped cream and that's what it was called when I was introduced to it. Now I know that it's also called Ermine or Boiled-Milk Frosting. No matter what you call it, it's good! It is hard to believe, but I have been making this frosting for 10 years now! I was working with my friend Vicki and her birthday was coming up. Of course I had to bake her a cake! She requested red velvet cake with whipped cream frosting. I had never heard of such a thing, other than the frosting some grocery stores call whipped cream. But, I am always happy to try a new frosting! She searched for the recipe of the exact thing she was talking about. I had certainly never made a cooked frosting like this! I had melted chocolate for frosting before and made Marlene's Fudge Frosting, but never something quite like this. I instantly fell in love. This frosting is not too sweet, it is just right. The flavor is subtle, a lot like whipped cream! However it does have better holding time and you don't have to worry about mixing it too long and turning into butter... it is already butter! The key is getting the flour and milk paste correct. It will still taste good even if it isn't perfect, but if you don't cook it long enough the frosting will be loose. If you don't stir it well enough, you could get small lumps. If you scorch it, well then you better start over! It really isn't that hard. Just don't be afraid to let it thicken and be sure to stand there stirring it while it happens. The first time I made this for my family everyone loved it. I made a couple of brownies, covered them in whipped cream frosting and topped them in berries. Everyone was asking for the recipe. Since then I have used the basic a idea for a number of other recipes. I love the final texture it gets. I have never tried piping it, I am not sure it would work for fine details. However, if made properly you could certainly frost a layer cake with it with no problem! Of course this frosting is great on red velvet cake and the brownies with berries as I described above. 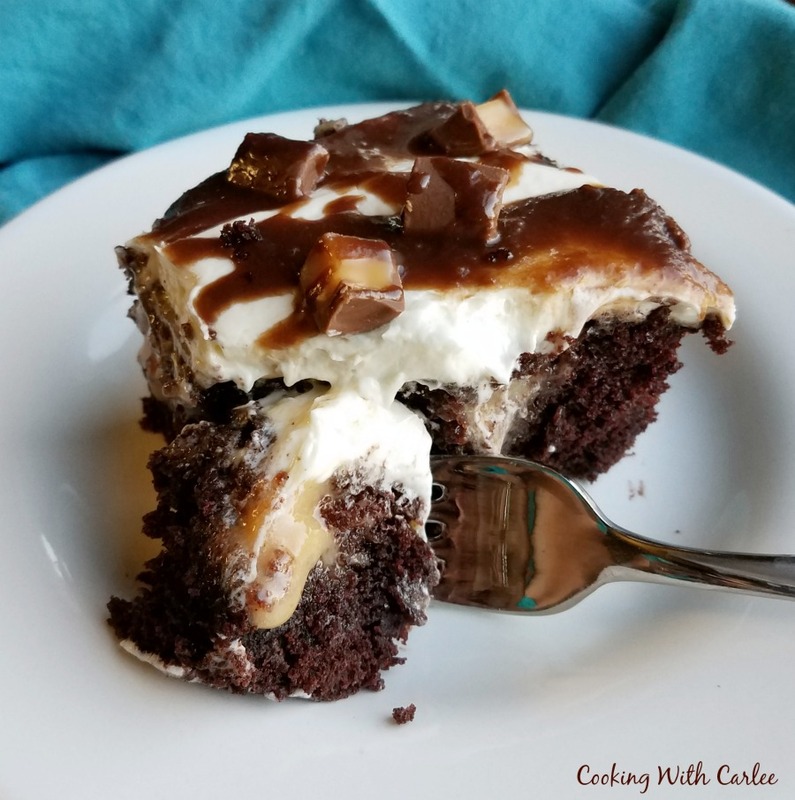 I also used it on my Rolo poke cake and that was scrumptious if I do say so myself! Have you ever made a boiled milk frosting? What is your favorite cooked frosting? This first step is the most crucial part to this frosting turning out. In a saucepan, whisk together the flour and sugar. Add the milk a few tablespoons at a time to get started. Stir until there are no lumps. Once you have a smooth paste, add the remaining milk and stir until combined. Turn on the burner to medium heat. 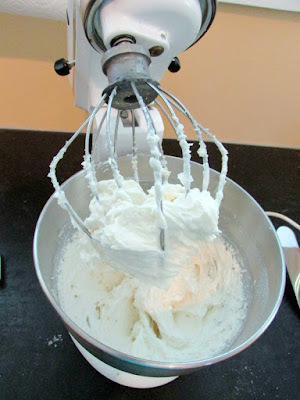 Continue to whisk and cook until the mixture thickens to a paste consistency. You want it to be pretty thick. It will be tempting to walk away and so something else, but don't. Once it starts to thicken it will go really quickly and it is important you don't get lumps or scorch the bottom. Place paste in the refrigerator to cool. Once paste is room temperature or cooler, add butter and vanilla to mixer bowl. Turn on low and stir until smooth. Add flour/milk paste and whip on high for about 10 minutes. Don't try to cut the time short, you really want to whip a lot of air into it. Spread on cakes, cupcakes, cookies or whatever scrumptious treat you are making! Whipped Cream frosting is always a classic. I know, I love the stuff! It's hard not to eat it straight out of the bowl! Who doesn't like whipped cream frosting! Looks delicious! I agree, sometimes frosting can get sickeningly sweet. I think this one is just right! Thanks for hosting and stopping by! I need to try this frosting next time i decorate the cake, pinning it! Thank you! It is a little looser than buttercream, so it may not hold up to intricate decorating, but it would certainly be great to frost a layer cake or something! If it were not 102 today I would go bake a cake just to try this. Thanks for sharing on Creative K Kids' Tasty Tuesdays link up. Hope to see you back next week. I can understand that for sure! We have been in the high 80s this week, which has felt like a nice break from the heat. Hopefully we stay in the 80s for a while! Thanks for hosting! I hope you enjoy this one. It is hard to go wrong with ganache though, yum! I love it. Sometime I have to bake something just as an excuse to make it! Thanks for stopping by! I love your recipes and your blogs. My family is from probably about every state in the south and I grew up with Southern cooking and you can't beat it. I have saved so many and my daughter (who's not really into cooking but likes to help) and my 4 grandchildren are staying with my husband and I for about 3 months. Three growing teenage boys and one beautiful petite little girl I love to pieces. I am saving up your recipes, especially all the scrumptious desserts!! Thanks so much Carlee!! Thank you so much! I am sure it has been fun getting to spend so much time with your daughter and grandchildren. I hope you enjoy everything you try and thank you again for your kind words! I can't wait to try this! Thank you so much for linking up at Tasty Tuesday! This post has been pinned on the Tasty Tuesday Pinterest board! I love having you and can't wait to see you next week! I hope you love it! It is one of my favorites. I hope you love it if you do! Thanks for stopping by! I am a cupcake baker and I need all the different frostings I can get! Thank you for linking up with us at the Tips and Tricks Link Party! Well this works out perfect, as I am a cupcake eater! ;-) I hope you love this frosting. I really enjoy playing with different frostings! Wow!! Can't believe that will make a whipped frosting!! Going to have to try!! Thanks for Sharing on My 2 favorite Things on Thursday!! Hope to see you again this week!! Pinned! 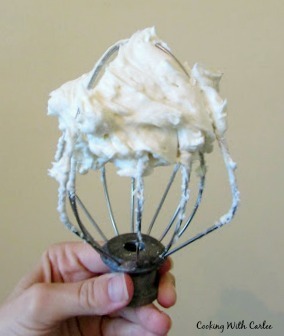 It doesn't seem like it would work, but it does make a very fluffy frosting. I hope you like it! Hi Carlee, I have gotten some of the best recipes from you. I pinned the Halloween brains recipe with shrimp tonight! My 4 grandchildren are staying with me for a few months and when they heard shrimp that was all it took. Thank you so much for all the good recipes!! Thank you so much, that is very flattering! We definitely enjoy our food around here. I am sure you are all having a great time in your months together. I know my parents and my little guy have a very special bond and I do with my grandma as well! It makes enough to generously frost a 9x13" cake. This is one of my absolute favorite frostings. I hope you love it! Oh no! I think the biggest thing is making sure you cook the flour and milk to a thick enough paste without scorching it and then making sure it is all the way cool before you add it to the butter and sugar. I sometimes put the milk/flour paste into the fridge for a little while to make sure it is cooled enough. 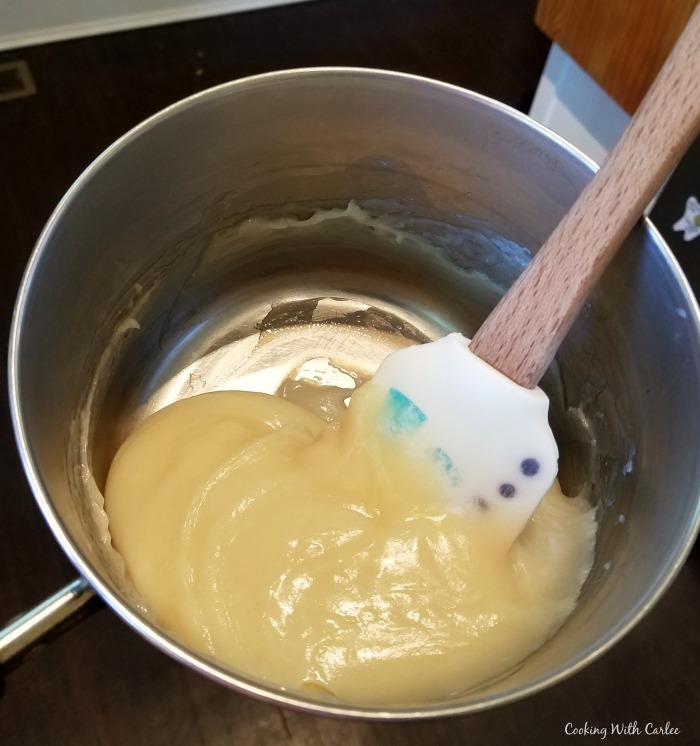 You want the paste to be thick enough that you have to help it into the mixer bowl, you don't want a pouring consistency. I hope you have better luck if you try it again. (5 T flour)can any one tell me how much flour this is?? 5 Tablespoons is just under a third of a cup or 8-9 grams of flour. I hope that helps! Without a doubt, this is my new favorite frosting. Followed your directions to the T, and it is sooo good!! Yay! I can't believe I am just now seeing this, but you put a smile on my face! While I absolutely love the flavor of this, it is rather sweet and took away from the flavor of the cake... maybe just me, but any suggestions on what can be done about toning down the sweetness??? You could certainly try it with less sugar. I think as long as you cook the mixture into a thick paste, the reduced sugar content shouldn't affect the final texture too much. It is certainly worth a try!